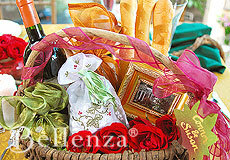 Home / Packaging Favors & Gifts / The 5-Minute Bridal Gift Basket Idea for Welcoming Guests! The 5-Minute Bridal Gift Basket Idea for Welcoming Guests! 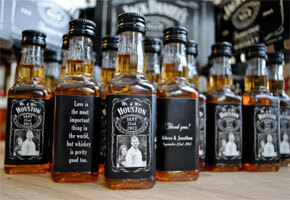 Wedding favors are for everyone. 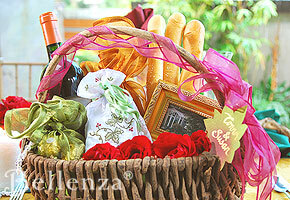 But bridal gift baskets are for those extra-special members of the entourage, as a way of expressing a heartfelt thank you. They are also perfect for extending a gracious welcome to out-of-town wedding guests, and pampering them with a thoughtful collection of gifts for their stay. Teeming with goodies, these gift baskets are actually quite easy to put together. The secret is to focus on the occasion’s theme. Gather a selection of items based upon that, arrange them artfully in a woven basket, and the presentation is ready in five minutes flat! Use a palette of warm autumn colors for this picnic basket-style presentation, filled with delicious treats—plus wine and roses. The homey, rustic look of a picnic basket filled with treats is just so appealing. This makes it the ideal gift basket idea for a relaxed, outdoor destination wedding set in a lush vineyard or at a quaint wine country inn. If the occasion has an Italian flavor, treats like a loaf of focaccia bread, a box of Amaretti cookies, and a bottle of Pinot Grigio would be wonderful additions to the basket. Finish it off with a bouquet of roses that adds a romantic touch to the presentation! When adding decorative accents, continue to keep the theme in mind. Select ribbons, flowers, and a gift tag all within the autumn color palette or in wine tones to complement the basket’s rustic look. The tag may be printed with the couple’s names or a simple “Thank You” in gold ink—again within the palette of fall colors. Bring memories and smiles with a “gift bucket” filled with thoughtful, beach-inspired goodies for guests at a seaside wedding party. The childhood charm of a blue plastic bucket needs no elaborate embellishments. Something as simple as wrapping twine around the handle makes the bucket instantly “look the part” and gives the entire presentation that organic, tropical feel. Little gems of imagination like this, sparked by the occasion’s theme, are what can transform an assortment of gifts tossed into a basket, box or bucket into something tasteful and original. – Think “summer tourist” and provide sunblock, lip balm, flip-flops, a hand towel, a sun visor, maps of the area, a ring for hotel keys, and even a deck of playing cards. 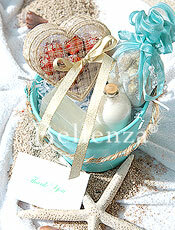 – Personalize each bucket according to each guest’s favorite sun care products. These can include facial moisturizers, soap cleansers, and tanning lotions. – Find clever ways to personalize the gifts in each bucket. For instance, put a sticker on each item with the guest’s name or the couple’s names and the wedding date. Or repackage personal care products in handy containers—by buying suntan lotion, bath gel, and moisturizing lotion in bulk and transferring them into pretty little travel bottles available at drugstores. This not only lessens the cost, it instantly ups the personality and charm of the gifts. 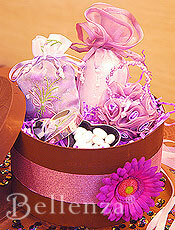 Go elegant with a hatbox-style presentation of spa gift items, each dressed up in the loveliest packaging. 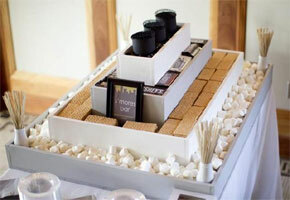 Bid guests goodbye with a warm “thank you” at a spa-themed bridal shower. 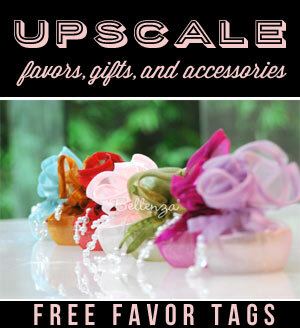 In a stylish hatbox-inspired container, present them with fun spa gifts as mementos of the party. The items themselves need not be expensive. It’s the thoughtfulness behind them, as well as the pretty presentation, that spells the difference. A box of any shape will do. But to capture the elegance of a hatbox, use a round box approximately 12″ in diameter and 6″ in height. Dress it up with fabric or textured wrapping paper, tie an elegant ribbon around it, and use a faux daisy for a whimsical finishing touch. Again, remember to keep within the color scheme of the shower for the right look. Got 5 Minutes? Create a Gift Basket! The countdown to the wedding day often includes the rush to prepare gifts for special guests and family members. Thank goodness, then, for gift baskets—and buckets and hatboxes! With a thoughtful selection of gift items and a stylish presentation within the occasion’s theme, no one will ever guess they’re so easy and quick to put together. I’m just in love with the beach bucket idea. We’re getting married on a yacht and I will be giving out little buckets filled with all sorts of themed goodies! Does anybody know where I can get some small beach buckets? I am using them for an engagement party with a tropical theme. Filling the buckets with flipflops, a small face towel, and a sachet of chocolates! That’s a great question. You can probably find buckets at places like Oriental Trading Co., but I also think that you can get them at stores like the 99 Cents Store, Michaels, or even Walmart. Another great and easy way to use those wraps is to use fruits, nuts, or even granola mix. A healthy alternative to candy! Luv the spa party box idea! Really great for a bridal shower. I’m thinking of doing something similar for my bridesmaids. Filling the boxes with their favorite pampering products from Body Shop. I’m also putting in some chocolates and cookies.